Is it weird that I absolutely love this film? Not just the story either, the characters, the songs - yes I own the album - the art style, the voice acting, the animation, the pacing, hell I even like the annoying animal characters that usually peeve me in movies like this. I don't know what it is, I guess it's a mix of all of the above, but I just can't get sick of it. At this point I must have seen this film about a hundred times and it's only been out on dvd since late march 2011. From it's detailed and funny cast of characters down to it's slow played romantic story arc, it's just a brilliant take on the rapunzel story. 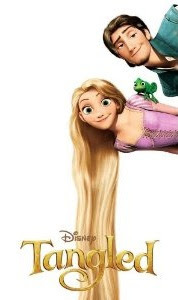 This version follows Rapunzel and Flynn Rider, a thief who accidentally came across her tower as they travel across the country so that Rapunzel can see the flying lanterns that she's watched from her window every year on her birthday, and so that Flynn can get back the crown he stole from the royal castle. Through a series of adventures the pair grow close and a romance blossoms between the two of them, only to seemingly be shattered as Rapunzel's 'mother' manipulates two men that Flynn screwed over into trying to kidnap her while making it look like he gave her up to them and tricking Rapunzel into thinking that Flynn betrayed her, as she said that he would. Flynn is arrested and sentenced to death and Rapunzel returns with her mother to her life in the tower, only to realise that she is actually the princess of hte kingdom, stolen at birth by her 'mother'. While this is happening Flynn realises what's happened and breaks out of jail to rescue her. It's odd that I just told you the majority of the film and yet refuse to tell you the conclusion. All things considered you won't guess it... or will you? huh? Well, regardless you should go watch it! Why are you still here? seriously? go watch it now.